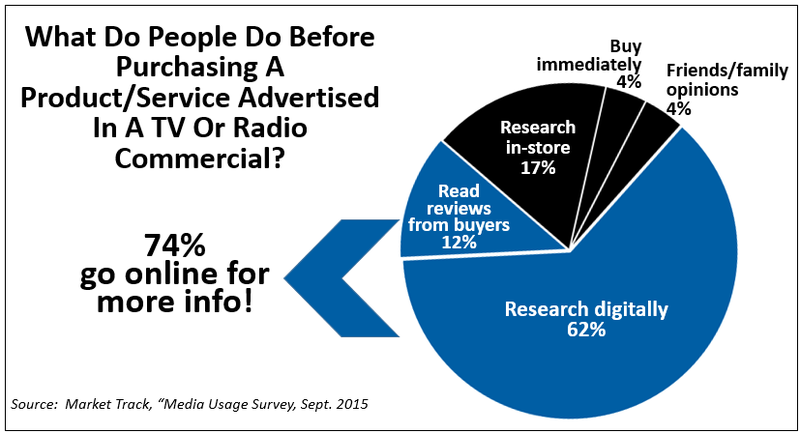 Just in case you thought that your TV, radio and print advertising was going nowhere, studies show that a consumer’s natural reaction is to go online for further information and read product reviews. A recent study conducted by Market Track found that over 74% of TV watchers are multi-tasking as opposed to channel surfing or fast-forwarding through commercials. Polls show that consumers are using second screens while watching television to shop online, check social media, and to surf the web. Knowing that traditional advertising will drive consumers online is great news for digital advertisers and proves that it is smart to keep your commercial and print ads in front of your mobile users. To find the best ways to combine digital marketing with your traditional strategies, contact Big Hit Creative Group.